Today's computer operating systems are intuitive enough that you can usually feel your way around without much assistance. But when it comes to mastering a behemoth like Windows XP, you're going to need some help--and that's something Windows XP Hands-On Training delivers in spades! Using step-by-step instructions and practical, real-life projects, master teacher Garo Green shows you how to use the desktop, work with files, install programs, and use Internet Explorer, Outlook Express, Windows Media Player, Movie Maker 2, and more. You'll even learn how to use Windows XP to edit a small piece of video footage. 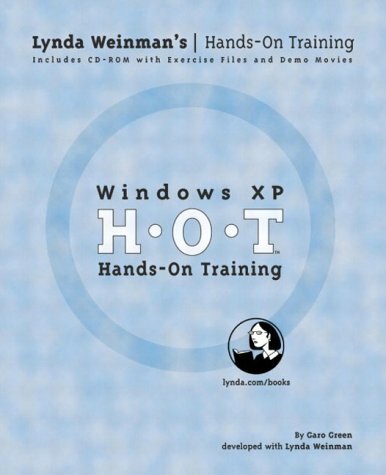 A light-hearted teaching style combined with the proven technique developed at Lynda Weinman's acclaimed learning center make this the ideal, hands-on guide to learning Windows XP. The book also comes with a CD-ROM that includes all of the project files used in the book and QuickTime movies that demonstrate the more complicated tasks so you never get in over your head. Garo Green is the director of publications at lynda.com, where he manages the Hands-On Training series. Garo has been passionately teaching people, in one form or another, for the past eight years and is known throughout the world for his humanistic, engaging, and light-hearted teaching style. Garo is the co-author of numerous Hands-On Training titles including Macromedia Dreamweaver MX Hands-On Training and Flash 5 Hands-On Training, to name just a couple. He is also the author of several lynda.com training CD-ROMs, such as Learning Windows XP, Learning Dreamweaver MX, Learning Fireworks MX, and many more.